I like how the thief is someone that you didn't expect. Also, it's interesting how the book plays out. Sometimes you think things are obvious, but it turns out differently than you think. Instead of just saying the baseball words, it says what the words mean. And also, people involved in the story may have nothing to do with the plot when you think they do. 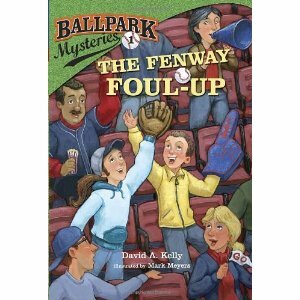 I would suggest this book for ages 6-8. This time when Mike and Kate go to a baseball game, they're going to Yankee stadium. 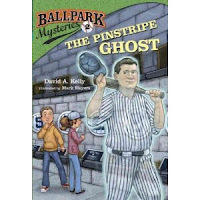 But rumor has it that the ghost of Babe Ruth has been haunting the stadium looking for his lost locker (they built a new stadium as the old was knocked down). Will Mike and Kate be able to solve the mystery of the pinstripe ghost, or will they be left with no clues? This book is a little more complicated than the previous one, so I'd suggest ages 7-9. The book was good, but very easy to read. I liked how nice one of the characters were when they gave up the caught ball to a young child. That happened to me once also! The vocabulary is simple and it is only 99 pages. It has cliffhangers and it also makes you want to read on. Mike and Kate are going to Wrigley Field, home of the Chicago Cubs. But when they find out that the most important part of the field is missing (the ivy surrounding the walls), they try to find the ivy thief (the thief is looking for a treasure said to be hidden behind the ivy on the walls)! 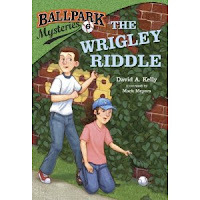 Will Mike and Kate use their genius to catch the crook, or will the treasure hidden behind the ivy be found!? If you've read any other book in the series, it's obvious that who they think it is isn't actually it. After reading two of these books, I obviously know who did it. Otherwise, it has a good story line and I suggest it for ages 6-8. One thing I like is that the two kids are very smart, and when they're doing something, you might not understand how it's going to unfold. It's part predictable, but still a very good book.